Tracing connections between craft and activism since the Industrial Revolution, this chapter critically reflects on discourses of craft and the handmade. Whereas the experimental animation community privileges analogue, handmade processes that appear to oppose and critique commercial animation production, it is argued here that this approach is underpinned by nostalgia and is often faked. What looks like a hand-painted animation could actually be a simulation that was “painted” in a software package. Aesthetics alone do not guarantee that a work of art opposes the mainstream. Instead of recycling the past to create “artistic” animation, contemporary practitioners can equally investigate issues of labour and materiality through digital tools and virtual materials. Animate Projects. 2016. “Animate OPEN: Parts & Labour.” http://animateprojectsarchive.org/films/by_project/animate_open_parts_labour/animate_open_parts_labour. Etsy, Inc. 2018a. “Shop for Anything from Creative People Everywhere.” Etsy. https://www.etsy.com. ———. 2018b. “Code as Craft.” Etsy. https://codeascraft.com/about/. Husbands, Lilly. 2016. 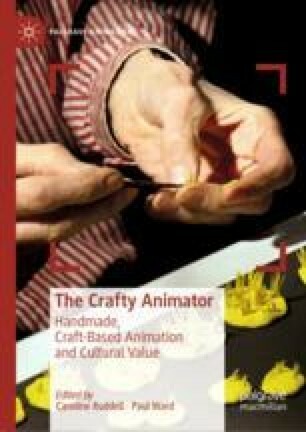 “Craft’s Critique: Artisanal Animation in the Digital Age.” Animate Projects. http://animateprojectsarchive.org/writing/essays/l_husbands_2. Loader, Alison Reiko. 2014. “Surviving the Animator’s Survival Kit: ‘I’m Not Bad, I’m Just Drawn That Way.’” Animationstudies 2.0 (blog). https://blog.animationstudies.org/?p=869. Maker Media, Inc. 2018. “Make Magazine.” Make Magazine. https://makezine.com. ———. 2011. “Inside Photoshop.” Computational Culture: A Journal of Software Studies 1. http://computationalculture.net/inside-photoshop/. Marx, Karl, and Friedrich Engels. 1969. “Manifesto of the Communist Party.” In Marx/Engels Selected Works, translated by Samuel Moore. Vol 1. Moscow: Progress Publishers. https://www.marxists.org/archive/marx/works/download/pdf/Manifesto.pdf. Mathis, Charles-François. 2016. “Ruskin’s Heirs: Art, Nature and Socialism.” E-Rea 13 (2). http://journals.openedition.org/erea/5106. Repair Cafe. 2018. “About.” Repair Cafe. https://repaircafe.org/en/about/. Shoreditch Sisters Women’s Institute. 2017. “About Us.” Shoreditch Sisters Women’s Institute. https://shoreditchsisterswi.com/about-us/. ———. 2016. “Noisy, Licking, Dribbling and Spitting.” Animate Projects. http://animateprojectsarchive.org/films/by_date/2016/noisy_licking_dribbling_and_spitting. Warburton, Alan. 2016. “Spectacle, Speculation, Spam.” In Edges: An Animation Seminar. Whitechapel Gallery: Edge of Frame. https://vimeo.com/194963450.